I had such a great time at Fulton Street ARTisian Market today. I got to be next to a good buddy of mine, Michele, she's a riot and a half, we laughed and had a very interesting day, with the wind blowing our stuff all over haha it was still fun. She was so generous; she loaned me some bungees, helped me prop my trunk lid up and was just there for me in general. What a blessing she was. http://www.secondsight.etsy.com/ for beautiful creations of magnets, hand pastel drawings and more! It's always fun to see my team mates and get to meet new people, do some networking and with the bodacious fairy beauties there are just laughs never ending at my booth. It makes it worth it for me, just to bring them and watch people laugh, smile, and sometimes even try not to laugh. Those people the ones that want to maintain their "proper" crack me up because you know they want to laugh but don't because of the company they are with. I had to go down and try the asparagus; I hate asparagus, haven't eaten it in over 20 years. My ex mother in law used to serve it on purpose just to piss me off. But I want to let her know that "it's all in how you prepare it sugar!!!" because the asparagus I had to day just rocked my world! Blue cheese crumbles, warmed over grilled tender crisp asparagus, marinated in some kind of salted wonder, was just heaven in this grandma's mouth. While I was picking up my greens, Sarah Roemer was calling to me trying to get my attention....in her hands was something that I'd been hinting about for a few weeks but never ever did I expect that she would go ahead and make one. 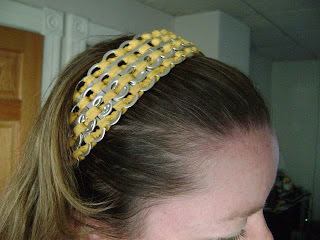 It was the most beautiful, yellowish gold headband made with her rawkin' pop tabs, and I seriously almost cried. What a moving display of loving friendship, thoughtfulness and selflessness! I really didn't know what to say. It is just beautiful. Thank You so much Sarah. It's just beautiful. Visit her shop at http://www.sjroemer.etsy.com/ for more of her creations using recycled pop tabs made into purses, bracelets and more!